Bizen 備前 ware. Pottery made in Inbe 伊部 village of Bizen province, modern Wakegun 和気郡 of Okayama prefecture. The oldest of Japan's 'six old kilns', bizenyaki is a continuation of the stoneware tradition that started with sueki 須恵器. 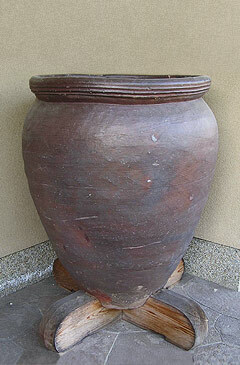 At the end of the Heian period, potters moved from Sue to Inbe for high quality clay and fuel for their kilns. In the Kamakura period more kilns were built, and potters began to produce pottery with distinctive red to chocolate brown coloring. The Bizen kilns were one of more than thirty complexes in Japan that fired utilitarian stoneware tsubo 壷 (jars), kame 甕 (wide-mouthed jars), and suribachi 擂鉢 (grinding bowls or mortars). During the Muromachi period, production was concentrated at fewer, larger kilns. Access to Inland Sea ports led to a distribution system with markets in central Japan. By the late Muromachi period, three large kilns were built to the north, south, and west of Inbe. The subsequent fashion for tea spurred production, with Inbe potters receiving the protection and encouragement of the local clan in the Edo period. Potters produced bottles, small water jars, mortar bowls, and seed jars, along with the artistic vessels offered to the court and shogunate. A new type of climbing kiln was widely used by the 19c, and Bizen potters began to make flower vases, tea wares, and sake 酒 cups and bottles. In the contemporary period, Bizen area potters came to number more than 20,000, including Living National Treasures. Bizen ware is divided into six types based on firing techniques: hidasuki 火襷 (see *hidasukimon 火襷文), winding straw around a piece to create a scorch mark; goma 胡麻 (sesame), a glaze formed by ash spotting; zangiri ザンギリ, a gray color derived from burying a piece in ash near a stoke hole during the firing; botamochi 牡丹餅 (red rice cake), a red color on those parts of vessels covered by other vessels in firing; fuseyaki 伏焼, in which dishes, platters, and other pieces are fired facing down to preventing the interior surface from becoming speckled with ash; and ao-bizen 青備前, wares with a dark blue color resulting from firing in carbon flames. The beauty of bizenyaki derives primarily from 'chance' effects of firing. 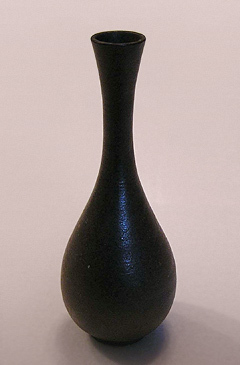 An absence of glaze emphasizes the beauty of the iron-rich clay and the simple, elegant vessel shapes. Bizenyaki were among the first Japanese ceramics deemed appropriate for the tea ceremony. From the mid-16c, Bizen potters supplemented their production of utilitarian wares with such tea-related vessels as *mizusashi 水指 (fresh water containers), hanaike 花生 (flower vases), and tokkuri 徳利 (sake flasks).